Brian John Robinson was born in Melbourne, Victoria, on 4 November 1930; he used to delight in pointing out that this was the day the champion race-horse Phar Lap won the Melbourne Cup. He was the first of two children of Raymond John (Ray) and Ellen Jessie (Jess, nÃ©e Guernin) Robinson. His father, born in Melbourne in 1905, was a journalist and author; he died in 1982. The Robinsons had first settled in Australia when Brian’s great-great-grandfather, William Robinson, arrived in Perth in 1852 on board the ship Palestine. Brian’s mother Jess was born in 1901 at Mount Lloyd, Tasmania; she died in 1973. She had the distinction of being the first female conductor on a Melbourne tram, and later became the columnist ‘Aunty Sadie’ of the Bulletin magazine. The Guernins had arrived in Australia around 1860 when Brian’s great-grandfather was given a grant of land in Tasmania. I went to Waverley school on the edge of Paddington, then a slum and notorious for the razor and acid gangs. As a kid from Melbourne I was treated just like the refugee kids arriving from Europe. I wore glasses and got beaten up every day but I made some great friends among the European Jewish kids. A succession of other public schools in various Sydney suburbs followed: Croydon, Rose Bay, Vaucluse, Woollahra and Artarmon. Although his hobbies included chemistry and crystal-set technology, academically he was a consistent underachiever. This may have been the result of ill health: scarlet fever had left him deaf in one ear and prone to constant infections. However, when these problems were overcome, he began to show a penchant for mathematics. His interests in mathematics and chemistry were encouraged during his secondary education at North Sydney Boys’ High School. Awarded a scholarship to the University of Sydney in 1948, Brian completed with distinction two years of an engineering degree, and was awarded the JA Garnsey Prize. He then transferred to the science faculty, and at the end of 1950 was awarded the Deas-Thompson Scholarship and Walter Burfitt Scholarship for physics and mathematics, respectively. The following year he completed a BSc with First-Class Honours, sharing the University Medal in Physics. He attended the Sydney 1952 Congress of the International Union of Radio Science (URSI) as an Honours student. This was a very important international event, because it brought together for the first time many of the world’s radio astronomers. Writing in 2001, Brian recalled Sir Edward Appleton’s address at the first plenary session. Appleton spoke of the newly discovered 21-cm wavelength radiation emitted by interstellar atomic hydrogen (HI). He highlighted the possible research it opened up and the need to protect the spectral band containing this emission for the benefit of astronomers. These issues were to loom large in Brian’s future career. 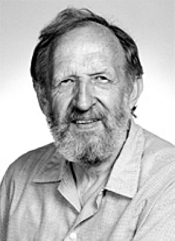 In 1953, he completed an MSc at the University of Sydney, with a thesis ‘Gyro-interaction of radio waves in the ionosphere’. His supervisors were VA Bailey and K Landecker. In May 1953, he joined JL Pawsey‘s radio astronomy group at the Division of Radiophysics as a fixed-term Research Officer. His appointment was timely: the group was starting to study the newly discovered HI emission. Interstellar hydrogen is the main constituent of the molecular gas clouds from which stars form. Its emission was to become the ‘workhorse’ of radio astronomy, spectacularly revealing the large-scale structure and dynamics of our Galaxy and other galaxies. Brian was put to work with FJ Kerr and JV Hindman at the Potts Hill field station, building a new 36-ft diameter parabolic antenna with which to survey the southern sky for HI signals. These astronomers were to use their results to map the spiral structure of the southern region of our Galaxy for the first time. Brian shared the first detection of HI emission from galaxies other than ours – the Large and Small Clouds of Magellan, our closest neighbours, revealed large extended envelopes of hydrogen gas. During 1954 he also assisted WN Christiansen in the construction of a radio astronomy interferometer, the Grating Array, beside the Potts Hill reservoir. In 1953, the Royal Society awarded Brian a Rutherford Memorial Scholarship at Cambridge University, and in 1954 he sailed to the UK to begin a PhD at Trinity College. Supervised by JA Radcliffe and K Weekes, he chose to study the nature of the ionosphere. He completed a thesis ‘Investigations of the E-layer of the ionosphere’ in 1957 and was awarded a PhD during the following year. As part of the thesis he designed and constructed an ionospheric sounder providing a power much higher than available with standard sounders. By comparing his measurements of ionosphere penetration frequencies and group heights with theoretical predictions, he determined scale heights of the atmosphere in the E-region. His results cast some doubts on the reliability of the routine methods of identifying the penetration of the ionospheric E-layer. His analysis of the detailed structure of the E-layer revealed the presence of more than one ionising process. In 1958, Brian was reappointed to the CSIRO Division of Radiophysics. However, instead of returning to Australia, he was immediately seconded to the Netherlands Foundation for Radio Astronomy (NFRA) as a Visiting Scientist to develop new high-quality observing equipment for CSIRO’s 64-m diameter radio telescope which was under construction (see Parkes radio telescope construction). In the Netherlands, radio engineers were busy developing sensitive equipment for their radio astronomers, who were at that time world leaders in HI research. In collaboration with these engineers, Brian developed new types of low-noise microwave amplifiers, working on maser amplifiers at the Kamerlingh Onnes Laboratory in Leiden and on parametric amplifiers at NFRA’s Dwingeloo Observatory. For operation on the Parkes telescope, he constructed a sensitive parametric-amplifier receiver to enable radio astronomers to undertake leading-edge research on the faint HI emission from galaxies other than ours. In 1962, he returned to the Division headquarters in Sydney as a Senior Research Scientist and installed the new equipment constructed at NFRA. In the ensuing years he moved up the ranks to become a Chief Research Scientist in 1975. Between 1968 and 1979 he took on the roles of Deputy Director of the Australian National Radio Astronomy Observatory (now the Parkes Observatory) operated by the Division (1968-70), Director of Research undertaken at the Observatory (1971-79), and Leader of the Cosmic Radio Astronomy Group at the Radiophysics Laboratory at Marsfield. Brian remained with the Division until his retirement in 1992, although taking leave in 1972 to spend twelve months at the Max-Planck-Institut fÃ¼r Radioastronomie in Bonn. In a half-century involvement in radio astronomy, Brian Robinson achieved international recognition and received many honours. During a forty-year career at CSIRO Division of Radiophysics, he undertook leading research, headed the Astrophysics Group, and contributed significantly in the Australia Telescope planning and funding campaign (see Australia Telescope Compact Array). Internationally, he distinguished himself in radio astronomy committees and negotiations to protect radio astronomy observations from interference from telecommunication transmissions. Dr Brian Robinson’s career spanned several critical periods in Australian radio astronomy. Often with a single-mindedness second to none, he contributed to the pioneering research of the 1950s and 1960s, led CSIRO’s radio astronomy group during the 1970s, and played a major role in promoting the Australia Telescope project to the Australian Government in the 1980s. In addition, to ensure a successful future for radio astronomy, for many years he spearheaded national and international moves to protect radio astronomy observations from interfering signals in the frequency bands that are used. Over his career he had a total of 105 publications. He pioneered the technical development of very sensitive receivers (masers and parametric amplifiers) used for the detection of extremely weak radio signals. His other major contribution was the use of emission and absorption microwave spectral lines to explore the galaxy. This was used to detect maser-like radiation by hydroxyl molecules within interstellar space and galactic centre. Towards the end of his Career, his research evolved to take in satellite navigation systems. Although the sensitivity of his parametric-amplifier receiver was not quite as good as another cooled 20-cm parametric system installed a few months previously for the measurement of the ‘continuum’ (mainly synchrotron) emission from radio sources, it was unique in that its bandwidth of 150 MHz was more than an order of magnitude larger than available on other systems. This meant that HI emission from galaxies with velocities Doppler-shifted over a range of more than 30 000 km/s could be observed without the receiving system having to be re-tuned. During the following four years Brian used his system successfully to investigate the hydrogen emission from our Galaxy, the Magellanic Clouds, and several other galaxies. Brian’s amplifier design expertise was acknowledged internationally. In 1963, the Institute of Electrical Engineers (London) awarded him and JT de Jager the Electronics Division Premiums for their 1962 publication ‘Optimum performance of paramagnetic diodes at S-band’. The first observations at 1665 and 1667 MHz covered a very narrow spectral range, and we thought that our improvised receiver had a monumental baseline slope; but in the middle there was, clearly, an absorption feature which we reported in Nature. It was three months before we were again allocated telescope time and discovered that the weak absorption feature was only part of a much broader and deeper absorption which was hardly visible in the 21-cm line. Brian and his co-workers had in fact discovered a dense molecular cloud centred at a velocity near +50 km/s. This discovery created some consternation, because the cloud appeared to be located near the Galactic Centre, in front of the radio emission, yet had a substantial positive radio velocity that was inconsistent with the accepted galaxy model of general uniform circular motion plus an expanding spiral gaseous arm. An acceptable interpretation did not eventuate until detailed studies of the structure of the central absorbing clouds and radio emission were carried out in the 1970s. He made several other key discoveries in this area, going on to study the Galactic Centre OH in more detail, and extending their research to OH molecular clouds in other regions of our Galaxy. The Australian OH research was acclaimed internationally; the fact that Brian was asked to write reviews indicated that he was regarded as an authority on the subject. The OH results set the scene for a continuing era in which molecular clouds in galaxies are studied both individually as regions containing massive star formation and collectively as tracers of the large-scale structure of the galaxies. In 1968, Brian had a brief flirtation with the newly discovered pulsars, stars emitting pulses of radiation at very regular intervals generally shorter than a second. One of his pulsar chart records showing the pulsed emission was reproduced on one side of the first Australian $50 banknote. For a detailed account of CSIRO’s research see Pulsar surveys and the discovery of the double pulsar. By 1970, overseas research was showing that many of the interstellar spectral lines of interest to radio astronomers had wavelengths too short for the lines to be detectable using the Parkes telescope. To enable Australian research in this field to be competitive internationally, Brian proposed the construction of a 30-m diameter radio telescope operating at millimetre wavelengths. Unfortunately, the timing of this initiative was bad. Although a formal proposal for the millimetre telescope was made to the Australian Science and Technology Council (ASTEC) in 1972, it was withdrawn in 1975 and replaced with a proposal for what became the Australia Telescope (AT). Brian provided major contributions to the final AT design, to ensure that it included a capability for spectral-line research (see Australia Telescope Compact Array ). At the same time, the immediate need for a millimetre-wave telescope in the southern hemisphere remained. Undaunted by his earlier failure, Brian obtained funding for a 4-m millimetre-wave telescope. It was constructed in the grounds of the CSIRO Radiophysics Laboratory at Marsfield, New South Wales, and commissioned in 1979. Brian directed its research until 1987, when operation of the telescope ceased, enabling its technical support staff to concentrate on the construction of equipment for the new antennas of the Australia Telescope (AT). The 4-m telescope operated at wavelengths near 3 mm, which included the wavelength (2.6 mm) of a spectral line of carbon monoxide (CO), one of the most important molecules for the study of cosmic molecular clouds. Brian directed the first extensive survey of the 2.6-mm CO emission from molecular clouds along the southern Milky Way (which defines the plane of our Galaxy). The study extended from 1981 to 1988, and Brian was involved in it for the whole period despite an emergency quadruple heart bypass and repair of his mitral valve in 1984. The survey provided the distribution and radial velocities of Galactic molecular clouds, and these parameters were transformed into cloud locations within our Galaxy. In conjunction with the results of a previous complementary survey of the northern Galactic plane, the cloud distribution revealed a large-scale Galactic structure consistent with a four-armed spiral. Brian’s most valuable legacy for a successful future in radio astronomy almost certainly lay in his efforts both nationally and internationally to keep the frequency bands used and planned for use by radio astronomy free from man-made interference. Radio astronomy involves the reception of extremely weak cosmic signals, many orders of magnitude weaker than man-made transmissions associated with services such as radio, television and radar. Therefore radio astronomy is not generally possible at frequencies used by these services. Fortunately, the regulation of radio spectrum usage has been organised through the International Telecommunication Union (ITU), a specialised agency of the United Nations Organization, and many of the frequencies used by radio astronomers are now protected. Protection for observations of interstellar molecules has been particularly difficult to obtain because the observed frequencies are set by nature, and thus there is no flexibility in choice of frequency bands. In view of the ever-increasing demands for additional frequency bands for new or expanding communication services, radio astronomers need to fight hard to maintain or improve the protection for their observing bands. His CSIRO colleague JB Whiteoak worked closely with Brian on frequency protection for over twenty years and considers that in this area Brian was an unsung hero. In addition to his participation in IUCAF and the IAU Working Group on protection of radio astronomy frequencies, from 1965 onwards Brian was closely associated with the ITU’s work on radio astronomy protection. He took over the national responsibility, which had previously been carried out by AJ Higgs, also of the Division of Radiophysics. Input for ITU meetings was organised through national and international study groups for the individual services using the radio spectrum. National Study Group 2 dealt with matters related to the national protection of radio astronomy, Earth exploration and space research. The work included discussions and negotiations with the Department of Transport and Communications on Australian policy in these areas. One particular national problem was the protection of existing Australian radio telescopes from new ground-based transmitters with planned locations sufficiently close to the radio sites for their signals to cause interference. On one occasion, a new gold/copper mine was planned for installation only eight kilometres from the Parkes Observatory. Brian led an exhaustive enquiry that demonstrated that the intervening topography would not sufficiently shield the Parkes telescope from the radiation emitted by the DC motors of the ore crushers. He suggested modifications to the mine design that would reduce the radiation to acceptable levels. Some of the modifications were included, and the mine has now been operating for several years without affecting observations with the Parkes telescope. In summing up Brian’s activities in radio astronomy frequency protection, JB Whiteoak believes that the successes achieved by Brian’s involvement are his most important legacy to the successful future of radio astronomy. Brian retired from CSIRO in 1992 but continued his interests in radio astronomy, his involvement with ATNF as an Honorary Fellow, and his participation in some committees. During the thirtieth birthday celebration of the Parkes radio telescope he presented a talk on early spectral line astronomy with the instrument. He prepared a history of the first forty years of frequency allocation, and gave presentations on ‘Radio astronomy and the international telecommunications regulations’ and ‘Reminiscences of early 21-cm research at the CSIRO’ at appropriate overseas conferences. Typically, in 2003 he participated actively in the 25th General Assembly of the IAU, held in Sydney. In the session ‘The Early Development of Australian Radio Astronomy’, he presented three talks: ‘Joe Pawsey and his influence on the development of Australian radio astronomy’, ‘Early observations of H-line in Sydney’, and ‘URSI (Sydney) 1952: the first international meeting of radio astronomers’.